TMaG says the new designs feature an enhanced color scheme, including a black finish and white tungsten heel/toe weights, which frame the ball at address. A matte-black shaft and high-polish sole round out the aesthetics. 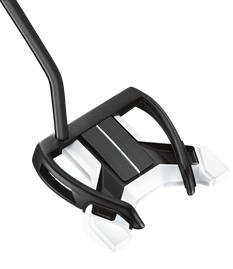 Daddy Long Legs (suggested retail price $249), according to TMaG, is the most stable putter in the trio, with an MOI of more than 8,500. The high-MOI design resists twisting at impact to protect ball speed on off-center hits, promoting a reliable roll regardless of where the ball is struck on the face. At more than 5,200 MOI, TMaG says the Spider Blade (SRP $229) offers the stability of a mallet putter in a blade shape to promote outstanding twist-resistance and distance control on off-center hits. The company says its research indicates that the Spider Blade is 50 percent more stable than traditional blade-style putters. Each of the three models feature a heavy steel frame, and tungsten heel and toe weights, all designed, according to TMaG, to raise the MOI to deliver increased head stability. To optimize counterbalance technology, TMaG says golfers should grip two to three inches below the top end of the grip when assuming a normal stance, posture and address. By doing so, more weight is “above” the golfer’s hands, which is key for increasing stroke-stability. Because players should grip down, each new counterbalanced putter is offered in two lengths – 38 inches for players who traditionally use a 34- to 36-inch putter – and 35 inches for players who traditionally use putter less than 34 inches.